This statement follows North Korea’s claim that it has tested a new type of missile that could strike South Korean and US warships "at will" if attacked. Four missiles were fired Thursday that traveled 125 miles before landing in the sea off North Korea’s east coast, according to South Korea national security head Chung Eui-yong. Pyongyang’s launch came only a day after a US Navy carrier strike group led by the USS Carl Vinson and the USS Ronald Reagan left the region following joint military exercises with Japan and South Korea. Washington and Seoul came the agreement to deploy THAAD last year, as North Korea continued its nuclear and ballistic missile testing despite sanctions from the United Nations and international appeals for them to cease this activity. The agreement was reached underly recently impeached former South Korean President Park Geun-Hye. Current liberal leader Moon Jae-In has called for a suspension of THAAD pending an environmental study. Moon’s office also ordered an investigation that found that the South Korean Defense Ministry, a holdover from the conservative Park administration, didn’t notify Moon or the public that the system would be receiving four new launchers. The Defense Ministry was also accused of trying to avoid a thorough environmental assessment by attempting to divide the land being used for the THAAD. A full study could take more than a year, according to officials. On Friday, Chung didn’t give a timeframe for the study but told reporters that postponement was decision made to make sure the deployment process was “democratic” and "transparent." "Our government plans to deal with the THAAD deployment with a few principles while being fully aware of North Korea’s nuclear and missile threats,” he said. “The government has no intention to fundamentally change what it has promised under the Korea-U.S. alliance." Chug added, "THAAD was a decision made to protect South Korea and US Forces Korea from North Korea’s growing threats," Yonhap reports. "The government will not handle such a decision lightly just because there has been a government change." Though Washington maintains the anti-missile system’s chief mission is to protect South Korea from attacks from the North, activists and residents of the southeastern Seonjou county, where the THAAD is installed, say the system is in place to help the US maintain its military advantage in the region. There has also been strong condemnation of the system from China, which claims the THAAD’s radar will be used to spy on their military activity. The US State Department reports that THAAD issue was on the agenda of the recent meeting between Defense Secretary Jim Mattis and Secretary of State Rex Tillserson. State Department spokeswoman Heather Nauert said during a briefing on Thursday that "North Korea’s actions just prove … that something along the lines of THAAD is something that’s important to not only protect US forces, to protect our alliance, and also to protect – help to further strengthen the region." 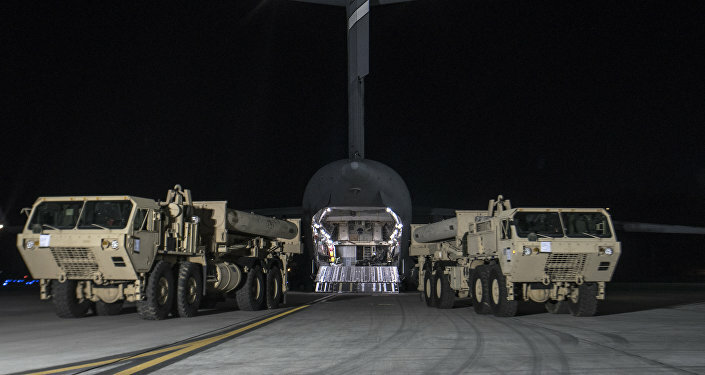 Nauert added, "We are aware, certainly, of the situation and the suspension of additional launchers, but — and we would continue to say that THAAD was an alliance decision at the time, and we continue to work closely with [South Korea] throughout the process."